I have to tell you, if I haven't already done so, I have Seasonal Affective Disorder. This year, for a brief few weeks, I actually thought now that I'm not working and could actually enjoy preparing for Christmas, that maybe I'd beat it. Maybe this time, I wouldn't get those winter doldrums, the cabin fever that hits me every winter without fail. But I was wrong. It doesn't matter if I have to go out in the winter weather or not, whether I'm working or not, I still hate winter. Yes, the blizzard was exciting, and fun, for a day or so. And it sure looks pretty. But I'm afraid to walk on the ice, I hate bundling up to go out, and now that I don't have to work, my tendency to hibernate in the winter is worse than ever. I don't want to leave my house for any reason whatsoever. But at the same time I hate being cooped up and held prisoner in the house. I need to move somewhere that doesn't have winter; a place where I can go outside all year, and maybe, just maybe have to put on a light jacket or raincoat from time to time. Yes, I'm talking about San Francisco, of course. Some of you already know that San Francisco is my favorite city, at least here in America. The climate isn't too hot and isn't too cold; the views are spectacular, and if I lived there, the constant walking up and down hills would probably get me in shape without any effort on my part, unlike my habits living in car-dependent suburban New Jersey. San Francisco has great restaurants, lots of things to do, and beautiful scenery. And if you get tired of the city (hard to imagine), the surrounding areas are equally wonderful to visit. Since today is the middle of the week of lost time between Christmas and New Year's, my cabin fever has risen to new heights, and I decided to immerse myself in daydreaming, via Realtor.com. Did you know that the prices for houses and condos in San Francisco are lower than I have ever seen them? And believe me, moving to San Francisco has been DH's and my fantasy for over 20 years, so I've been watching real estate prices out there ever since Realtor.com ever came on line, whenever that was. Up until about 2 years ago, when all hell broke loose in the economy, there was not a single condo or house in the City of San Francisco that would be remotely affordable no matter how valuable our house in New Jersey might be. I saw prices of $500k and up for the tiniest studios. Well, that's not the case now! Prices are so low out there from what I see that we could actually buy something right now if we could sell our house immediately and move out there. Unfortunately, what with DH's aging parents and my aunt still in the picture, that possibility is not going to happen in the near future. And certainly I don't want to hasten the time when aging relatives are no longer with us. So what is the solution to my winter daydreams? Any suggestions are welcome. 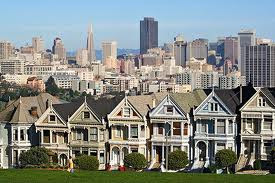 Because with our luck, by the time we can sell our house, the prices in San Francisco will be back to the stratosphere. In the meantime, enjoy a few pictures of affordable pieds-a-terre in the City by the Bay. It's the way I'm getting through my Seasonal Affective Disorder, for today anyway. Tomorrow I think I'll move on to Hawaii, where prices have also dropped dramatically! Here's a condo at 240 Lombard Street, right near Telegraph Hill, for just under $350k. Here's one for $339k on McAllister Street, right near Alamo Square, where people take that famous picture that's on the postcards (see below). And if we want to be near the ocean and Golden Gate Park, check out this one, a 2-bedroom condo for $343k. Now, I know these prices may still sound high, especially if you live outside the metro NY area; but the 1-bedroom condo in that last building is only $209k, and there are plenty of others in the low $200s and even below, if you aren't looking for an ocean view or a short walk to Telegraph Hill. For instance, this studio for $199k with views of the city, a swimming pool, community exercise room, and other amenities in Diamond Heights. Or, if you're willing to be a little farther from downtown, here's a one-family house for only $239,000. Oh, I know, if it sounds too good to be true, it probably is. The condos with the low prices probably have high monthly homeowner's fees, the single family house probably is in need of TLC, and so on. But the fact remains, suddenly San Francisco is at least in the realm of possibility. And that helps get me through my winter blues. And, since this is how I spent my afternoon, here are the Mamas and Papas singing "California Dreaming." Well, for once the predictions of a real blizzard came true. Usually they start with the dire predictions and then it turns out to be a bust. This time they went in the opposite direction. First they said the storm would probably miss us and be out to sea. The next thing we knew they were saying 11 to 16 inches of snow and then they upped it to 18-24! I think we got closer to 24 inches than 18. I'm posting a link to our local placeblog, Baristanet, which features a lovely slide show of the conditions in our northern New Jersey area. And here are a few pictures of my own. Enjoy the snow, everyone! For your viewing enjoyment, Stephen Colbert and Jon Stewart sing a holiday duet for you. May all you who celebrate Christmas have a lovely Christmas Eve, a Merry Christmas Day and a wonderful weekend of fun, festivities and family get-togethers. And everyone else enjoy their weekend and time off! The Democrats Finally Get It Done! After all the compromising on other issues, the Democrats have finally passed legislation to end the Armed Forces policy of "Don't Ask, Don't Tell." By a vote of 65 to 31, including eight Republicans, the up or down vote passed the Senate and will go to President Obama's desk for his signature. Finally, an important promise made during his campaign has been kept by President Obama, righting the wrong that was done back under the Clinton Administration that forced gays and lesbians in the services to hide who they are. 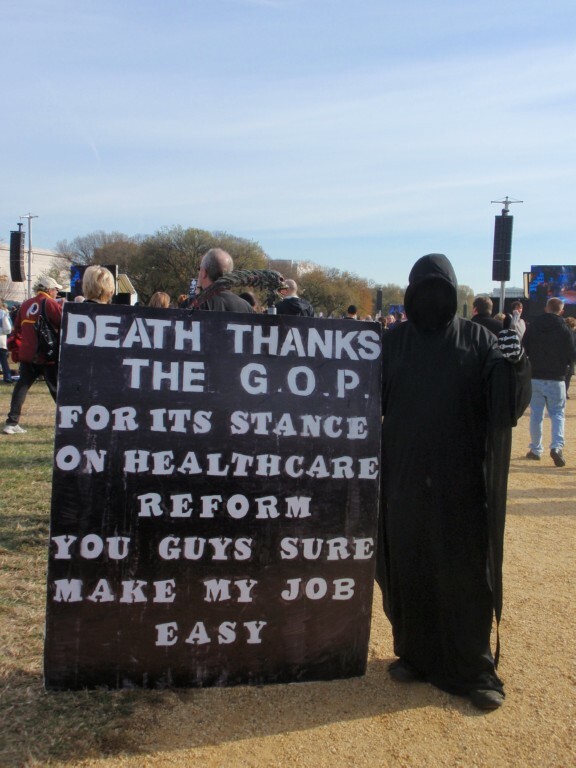 "Senator John McCain, Republican of Arizona and his party’s presidential candidate in 2008, led the opposition to the repeal and said the vote was a sad day in history. 'I hope that when we pass this legislation that we will understand that we are doing great damage,' Mr. McCain said. 'And we could possibly and probably, as the commandant of the Marine Corps said, and as I have been told by literally thousands of members of the military, harm the battle effectiveness vital to the survival of our young men and women in the military.'" Needless to say, some day people will look back on that comment and note the absurdity of it, especially since gay and lesbian service members have already been serving honorably in the armed forces all along, side by side with their heterosexual comrades in arms. "'We righted a wrong,' said Senator Joseph I. Lieberman, the independent from Connecticut who led the effort to end the ban. 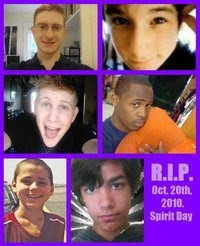 'Today we’ve done justice.'" Of course, the day wasn't all good - the DREAM Act that would have allowed young immigrants to gain a path to citizenship by joining the armed forces or attending college for two years, among other stipulations, was voted down. Despite passing by a majority (55-41), it lacked the 60 votes needed to overcome a filibuster. Something has to be done about the ability of opposition parties to filibuster just by saying they will. But that is a problem for another day. Baxter here. Yes, I know. I've been Gone a Long Time. Not MY idea, let me tell You. My Humans have been in the Dumps for the past three weeks what with the Election Results and all. Plus they've been taking that Little Cat and That Dog up to their Cabin for the weekends and leaving Me here Alone. I have been Annoyed for weeks now with this Behavior. So I've been taking it out on Them by leaving Turds on the Carpet in the Foyer. I intend to keep Doing This until they Get the Message and stop all this Traveling. I don't mind it once in awhile but This is Ridiculous. OK, so here I am, and High Time it is. I too am Disgusted with the Midterm Election Results but that isn't going to stop Me from Blogging. All the more Reason to be Involved, I say. I know my Female Human had hoped that the Rally to Restore Sanity might actually inspire Younger People to get out to the Polls on Election Day. 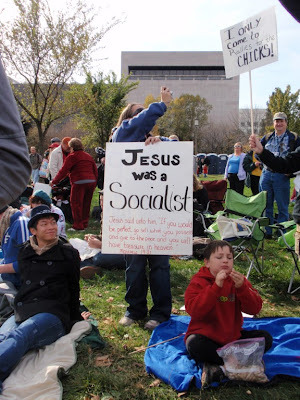 Unfortunately it apparently didn't, since more stayed Home and didn't vote compared to 2008. However, those Younger People who did vote, still tended to vote Democratic, so that was still Encouraging. In Fact, Democrats in General didn't turn out at the Rate one would have hoped, resulting in the "Shellacking" that Democrats received in the Election. Everyone has a Story as to Why this happened. But you know what? I don't care. To Me it just shows that that apparently most Humans are Stupid and have the Attention Span of a Gnat. Economy not fixed in less than Two Years? OMG, Massive Fail! Let's vote out the Democrats! Puh-leeze, it took eight years to get INTO this Mess; Ceiling Cat Himself couldn't have fixed it in two. 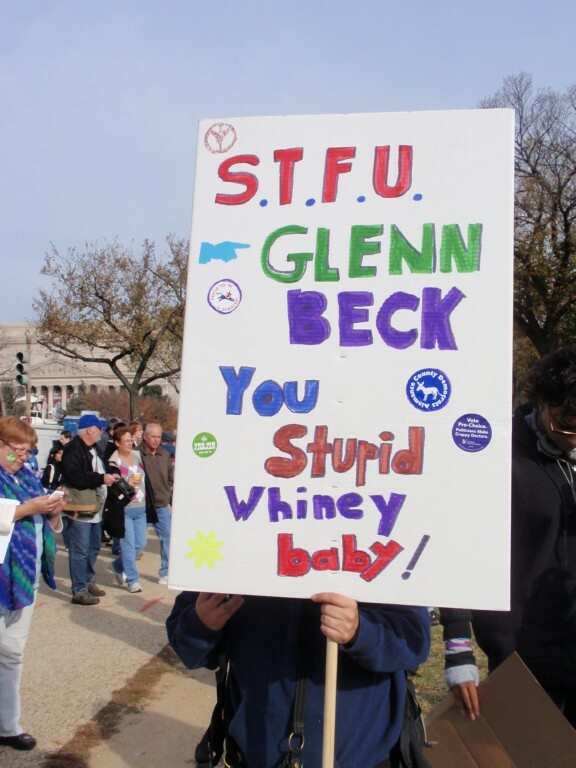 So now instead of the BiPartisanship and Kumbya spirit Touted at the Rally to Restore Sanity - or even a Return to Real Values that maybe the folks who showed up at Glenn Beck's rally may have Wanted - we get Two More Years of Total Gridlock in Washington. This isn't really what the Humans were voting for on November 2nd, in My Opinion. It's going to be like a couple of Tomcats sitting in opposite corners of the Yard caterwauling at each other for the next Two Years. And then who knows? The Humans may throw all those New Guys out too. You live by the Revolt, you die by the Revolt. Of course, it would be Nice if President Obama finally realized the Republicans will NOT work with him come Hell or High Water, and finally started just Doing Stuff because it's Right instead of watering Everything Down to make the GOP happy - since it didn't Work anyway. Hey, President Obama: When you have a Senate Minority Leader saying Out Loud that his main purpose is to make you a one-term President, doesn't that give you a Hint that maybe it won't help to try to Compromise with his Party? I mean, I'm as BiPartisan a Cat as you can find; I try to look for Middle Ground with other Cats - but I do draw the Line at Dogs unless they are willing to Meet Me Halfway. On Other Subjects, it is Almost Winter, and as an Indoor Cat, it really doesn't bother Me at all. But the Humans are acting Dejected. Soon they won't be able to go up to That Cabin they go to. I'll be Happy but Little Cat will probably not be. She'll have to share the house with Me for the next few months with no Breaks. But so far we are getting along a Bit Better. She minds her Business and I mind Mine, and That Dog has been pretty much keeping out of our Hair altogether. I think Little Cat has cowed her and she's more Respectful to Me these days. Guess Little Cat wasn't that bad an Addition to the Family after all. So, that Holiday the Humans call Thanksgiving was yesterday, and as Usual they had that Cooked Bird they make in the Oven. My Humans don't use the Oven much so I always know it's some kind of Holiday when they turn it on. At least when they're not heating up Pizza. I had a few Scraps of Turkey but I'm really not big on Human Food. Little Cat enjoyed hers, as did That Dog. Next I think comes that other Holiday where they put a Tree up in the House. I've never quite Understood this but it Smells Nice for awhile until it dries out. Of course Today is what is known as Black Friday to the Retailers. I Personally have never understood why Anyone would purposely go to a Mall or other Large Store on a day when EVERYONE ELSE would Be There. Of course, I am a Private type of Cat and prefer having a Lot of Personal Space. But my Humans agree with Me on this. In fact, my Female Human has done all her Holiday Shopping On-Line for at least the last 10 years. So, in the Meantime since Nobody here is Shopping, I thought I'd try to find some Bits of News that you might like to Know About that have nothing to do with Politics. 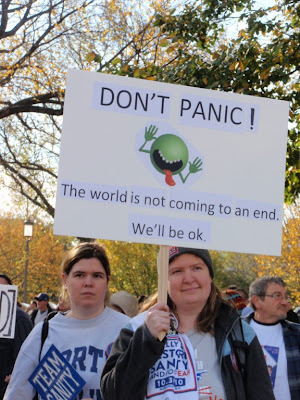 Let's face it, we're all kind of Burned Out now, and it is only going to get Worse as the 2012 Election approaches. Right now I have No Idea who'll be running for the Republican nomination, except the possibility of Sarah Palin. Makes my Fur Twitch to even think about it. Of course you are All aware of the Big Furor over the new TSA Scanning and Pat-Downs at the airports. Humans everywhere are talking about what an Intrusive thing this is and how it is tantamount to being Felt Up or Violated by the TSA. Well, now there is a Solution! The wonders of American Capitalism at work. Yes, it's Underwear with "Fig Leaves" to cover the Important Parts. (Actually for Women it's Clasped Hands over those Parts - strange, to Me. Why not Fig Leaves for Everyone?). It also makes Me wonder, if it can cover your Parts, can't this same Material cover the Plastic Explosives? It would seem that having this Underwear on would just make You subject to one of those Feeling Up Pat-Downs You don't want to have either. Anything to do with Private Parts always bothers Humans. Apparently down in Australia they are having a Big To-Do because of some Art depicting Humans with the Heads of Dogs. It wouldn't be That Big a Deal since the Dog-Humans aren't doing anything Obscene, but apparently they are Naked and since Humans have no Fur their, um, Parts are showing. Check out the Link for more Info. As for News in the Animal World, out in San Jose, California a Family got featured on the TV Show "Hoarders" for having so many Rats that they were Tearing Apart the House. Afterwards the Humane Society rescued 1000 of the Critters and they are now Available for Adoption. Oh come on, just let Me, Little Cat and That Dog at them. We'd make Short Work of them and there would be no further Rat problem in San Jose! In a Report that hits - ahem - Rather Close to Home, a recent Study reports that not just Humans, but also Animals that live near them, are getting Fatter. This even applies to Lab Rats, whose Diets are Controlled and have not Changed much over Time. There are several Hypotheses as to Why. Scientists think it could be Pathogens, Hormones or even Temperature that is causing it. Maybe my Humans are keeping the House warmer these days. Or perhaps Global Warming is making us Fat? Either way I'm relieved of Any Responsibility since my Humans control the Food I eat and the Temperature! (For those that don't know, I am a Bit Overweight Myself - 22.5 lbs. last time I went to that Vet Office). So that's All for Now. I hope you All had a Wonderful Thanksgiving and are enjoying the Long Weekend. Stock up on your Catnip to get you through the Holidays and I'll be Back Soon. The Rally to Restore Sanity - What Did It Mean? 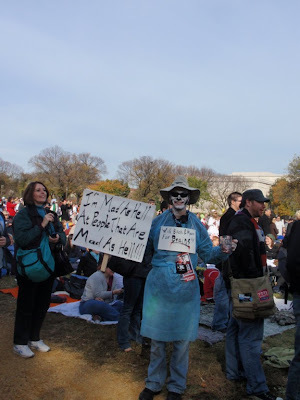 Now that I've had a day to think about the meaning of the Rally to Restore Sanity and/or Fear, it's time for a summary of my experience there. We went to Washington DC with very good friends of ours, who were kind enough to drive. We had booked our hotel about a month earlier not long after the rally was announced, and found some inexpensive hotel rooms at a very pleasant Holiday Inn near Old Town Alexandria, VA. That turned out to be a great decision, since downtown Washington would have been a complete zoo. We were a 20-minute Metro ride from the rally, and since we were so far out we had no problem getting comfortable seats before the crowds started piling on. The excitement mounted as we approached the National Mall. 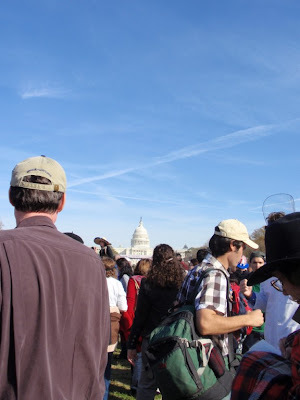 We were surrounded by others who were also obviously heading for the rally; many wore T-shirts and other "Rally to Restore Sanity" or "Fear" paraphernalia. 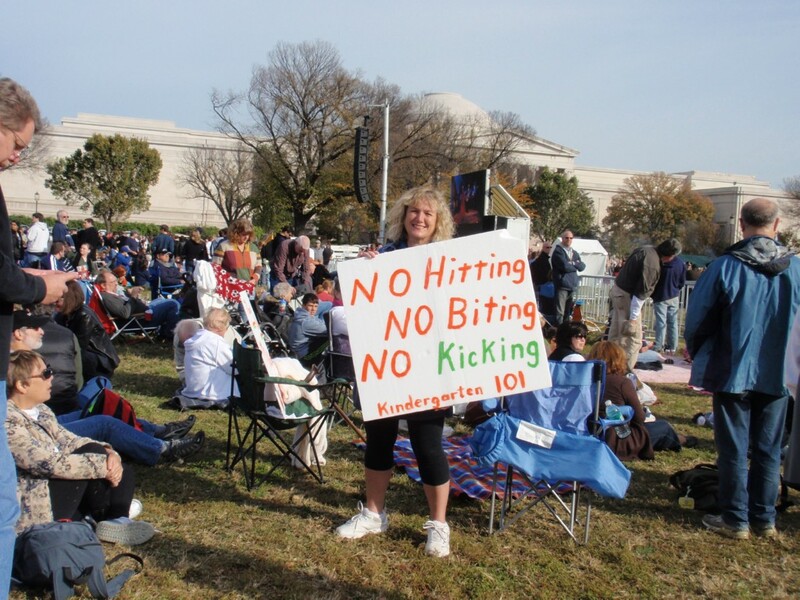 We arrived at the National Mall a little before 10 a.m. and walked along, heading toward the direction of the stage,taking pictures of signs that we thought were noteworthy, and finally realized we'd reached a spot as close as we could get; the front section was already packed with people and was closed off. We eventually ensconced ourselves in front of a Jumbotron, behind a crowd control gate. As it turned out, this was an excellent decision, since later arriving attendees were so far back they weren't even close to a Jumbotron and had trouble hearing any of the performances, let alone seeing them. So, what was it all about? It was a combination of musical acts (The Roots, Sheryl Crowe, John Legend, Kid Rock, Ozzie Osborne, Yusuf - formerly Cat Stevens in his previous life, the O'Jays, Mavis Staples), Daily Show/Colbert type skits (Fear vs. 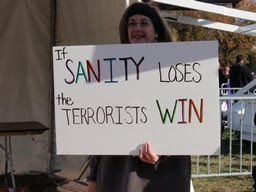 Sanity) and more. The crowd was warmed up by the music of The Roots, then by the guys from Discovery Channel's show "Mythbusters", who got the crowd to do a "wave" from front to back, then from both ends of the crowd. They also had everyone jump and land at once to see if it caused a seismograph to register the impact as a slight earthquake (it did; very slight, like a 35 mph crash of a car into a wall). 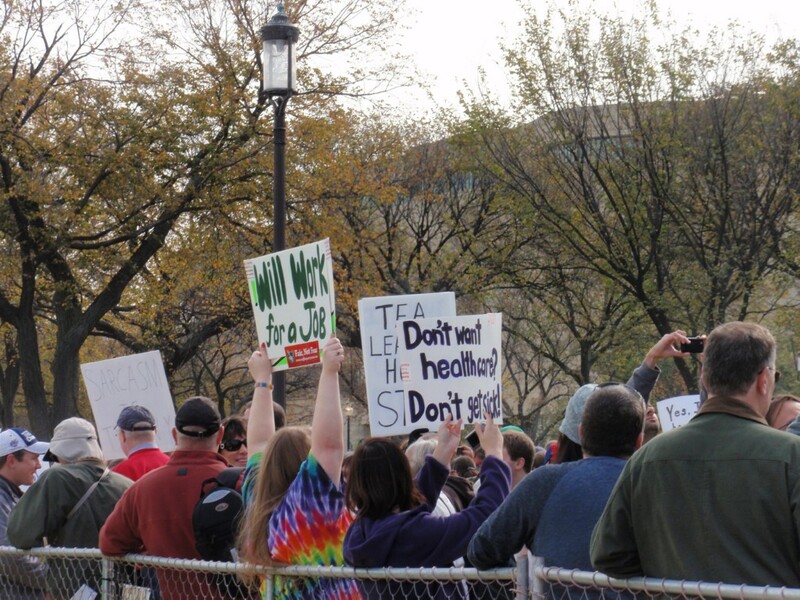 "The rally seemed to attract a truly like-minded crowd full of people who really did feel as if things have gone way too far beyond insane in politics. Jon Stewart’s main message, based on his final speech, was that the 24/7, all-hype all the time, news media is doing us a disservice; that most Americans are willing and able to compromise in order to get things done. He used the example of a stream of traffic gradually narrowing down to one lane to get through a tunnel – no matter what their beliefs, they are all just trying to get to their jobs and get things done, and they are able to give a little in order to get a little. A lot of great points were made – that just because people of Muslim descent happened to be the terrorists who blew up the Towers, doesn’t mean all Muslims are terrorists. That individuals should be considered, not groups. The guest stars were all great, the music was too. It was a huge crowd. I’ve never gone to something like this before, so can’t judge, but it sure looked as if an immense number of people attended this rally. There were people for peace, people for irony, people who were pro-Democrat, people who were pro-nonpartisan. It was all good. Everyone was polite and no one littered as far as I could see (a special request from Jon Stewart). We were thrilled to see and hear the artist formerly known as Cat Stevens (now called Yusuf) sing “Peace Train.” There were a lot of amazing musical acts and the crowd enjoyed it all." 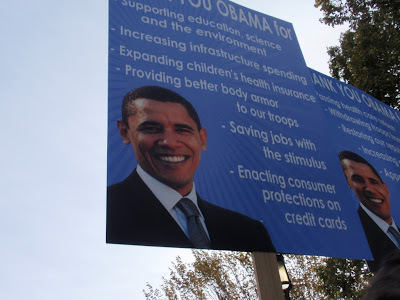 Yes, I admit, between the Christine O'Donnell ones and stuff like this one below, not all the signs were nonpartisan. But the majority of the ones I saw were in the spirit of the rally. 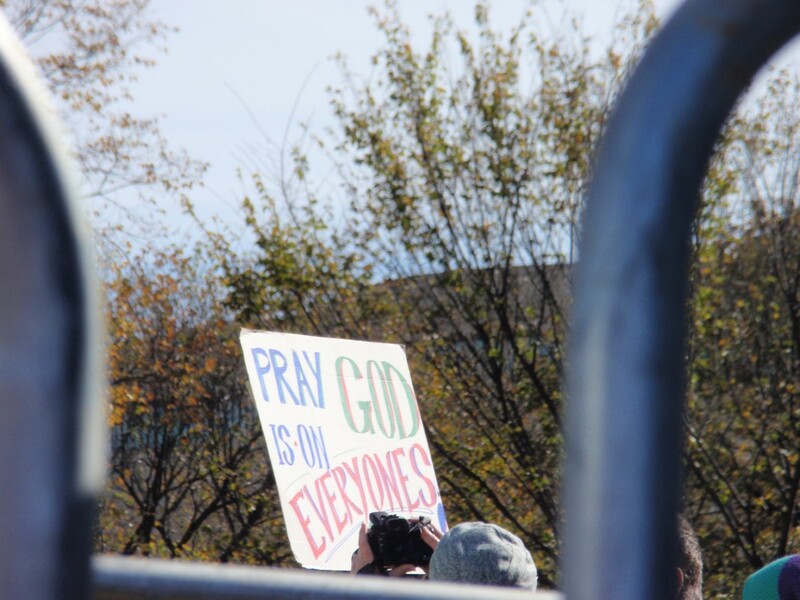 This sign said "Pray God is on EVERYONE's side!" These twin Obama signs listing his accomplishments were held by two red-headed twins, who unfortunately walked by too fast for me to get the full effect. Many signs referenced the origins of the sign-holders. They came from all over the country. One of the Jumbotrons showing videos from the shows leading up to the rally before the rally actually began. Loved this one. I know it's hostile and not in the spirit of the rally, but it was good nevertheless. People of all ages were there, from kids up to seniors who were probably at the 1963 MLK march. 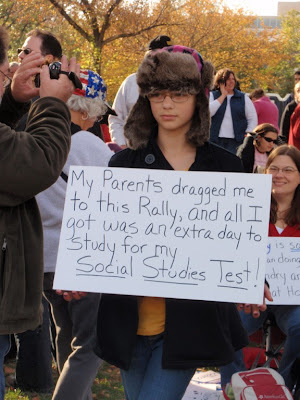 Below is my friend's daughter with her ironic handmade sign (we found cardboard and a Sharpie at the event for her to make a sign). 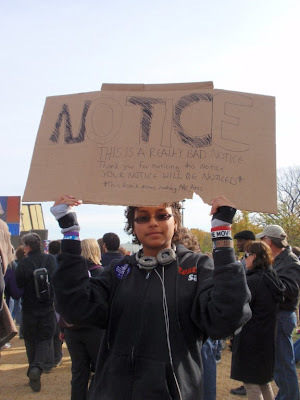 It says "Notice. This is a really bad notice. 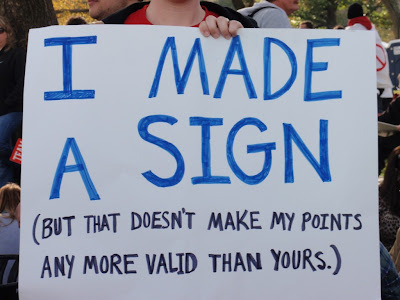 Thank you for noticing this notice. Your notice will be noticed. * *This asterisk means nothing, Mr. Ates." Mr. Ates is her history teacher. Don't ask me what it all means but she was proud of it. It also came in handy when our feet got tired, as we were able to sit on it instead of on the damp grass. This is her dad holding up the shirt he bought on the way in to the rally, which shows a picture of Bush and says "I screwed you all, but thanks for blaming it on the black guy." 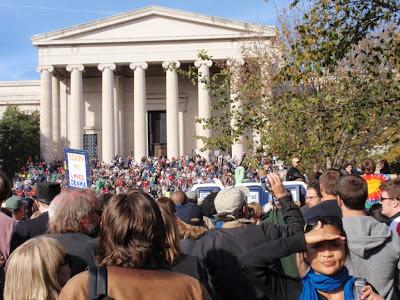 Crowds on the steps of what may be the National Gallery of Art (or possibly the Museum of Natural History), taken as we were leaving. Leaving the Mall at the end of the event was not an easy task. The crowds were packed tightly and moved slowly; yet everyone was polite and in a good mood. Then once we finally made it to the Metro, it was even worse - people were packed in like sardines. Again, everyone was still patient and pleasant. We finally got on a train back to Alexandria, arrived at our hotel, and settled in to the bar for a couple of drinks and nachos, followed by dinner in the hotel. We had hoped to go into Old Alexandria for dinner but couldn't face walking another step. Naturally, since the rally, there have been hundreds of articles written, blog posts posted, and discussion about the event. Keith Olbermann was not happy that Jon Stewart showed clips of him as well as Fox News pundits, as an example of extremism. He says, with some justification, that it really is a false equivalent to compare his show to, say, Glenn Beck's. His contention is that he reports on actual facts, not made-up stories, and adds emotion to them, which is not the same as the kind of fear-mongering done over at Fox. However, he has announced that he will suspend the "Worst Persons in the World" segment of his show and replace it with something that is less over the top. If you click on the link it also includes a video clip of his comments. "I have two things to say about Jon Stewart's speech: Number 1: Bravo. And Number 2: Bravo. I'm a small l and capital L liberal and that 'you go, I go, you go, I go' principle, I believe it and I am really happy that in my country over 200,000 people turned out to cheer that. No joke." So let's see...what else has caused controversy? Oh yes, of course. Yusuf. The former Cat Stevens, turned Muslim 30+ years ago. Back in 1989 he seemed to agree with the fatwah against author Salmon Rushdie. He claims to have been taken out of context and misunderstood. From the abridged video clip on the internet it's really hard to tell what his intentions were in the British television show in which he participated. The full episode link cannot be found. If you go to the Frequently asked questions section of his website you can get his responses to many of the controversies surrounding him. Personally I tend to believe in his sincerity. But you know what? It was over 20 years ago. Since he now says he did not believe that, even at the time, I have to take him at his word. And even if he did believe it at the time, his actions since then have been about peace and philanthropy. Funny how we can always forgive someone's foibles (the late Senator Robert Byrd's racism comes to mind) unless, of course, they are a Muslim. "I wish to express my heartfelt horror at the indiscriminate terrorist attacks committed against innocent people of the United States yesterday. While it is still not clear who carried out the attack, it must be stated that no right thinking follower of Islam could possibly condone such an action: the Qur'an equates the murder of one innocent person with the murder of the whole of humanity. We pray for the families of all those who lost their lives in this unthinkable act of violence as well as all those injured; I hope to reflect the feelings of all Muslims and people around the world whose sympathies go out to the victims at this sorrowful moment." He also performed an a capella rendition of "Peace Train" for the Concert for New York City in memory of the September 11 terrorist attacks. "The show was a huge success. At a time when battle clouds are gathering and the country is bracing itself for another dangerous political showdown, about one hundred and fifty thousand ‘sanity seekers’ converged on the Capital and enjoyed a blissfully sunny, bright and funny Autumn afternoon on the lawn. This event may not change the world, or the destiny of the elections, but it was great reminder of the peaceful hopes of many, to rise up and re-state their ardent wish for more sanity and less fear. Glad I was there." So, given his controversial past, why did Jon Stewart choose to have Yusuf at the rally? Personally I think that he was part of the point Jon Stewart was trying to make; that we all have different beliefs and yet we manage to get along during our daily lives. And besides, he needed him to sing "Peace Train," so Ozzie Osborne could interrupt with "Crazy Train," and then both be driven off the stage with the O'Jays singing "Love Train." It wouldn't have worked without the "Peace Train" part. It was not the first time Yusuf has been involved with Stewart/Colbert. He appeared on Colbert's show in May of 2009. I hope people who still can't forgive Yusuf for a controversy that is two decades old will not magnify his appearance all out of perspective and castigate Jon Stewart and Stephen Colbert for including him in the show. I can tell you, the attendees went nuts when he started singing "Peace Train" and actually booed when Colbert interrupted the song! The main point Jon Stewart was making, besides toning down the rhetoric and trying to work together, was that we need our news to be news, not commentary. It seems as if there is nowhere to turn anymore for truly unbiased news - news where the reporters TRULY report, and let YOU decide, ironically copying the Fox News motto. I have to say, even the New York Times, which I used to really feel was the "paper of record," has been disappointing me in this regard in the past several years. More and more, stories appearing on the front page that should be straight news reports, include a level of subjectivity and bias that is obvious. Sometimes they have articles labeled "news analysis," which is OK because at least it warns you that this is what you are reading. But more and more I'm seeing this tone in articles with no such labels. Come on, Fourth Estate. You can do better. Let's get back to real news and stop telling us what it all means. Let US figure it out. And go vote accordingly. Last, many people who weren't at the rally are commenting on blogs and other forums that this was a corporate sponsored event, that it wasn't grassroots, that the people who attended are just silly and didn't even know why they were there. I disagree. 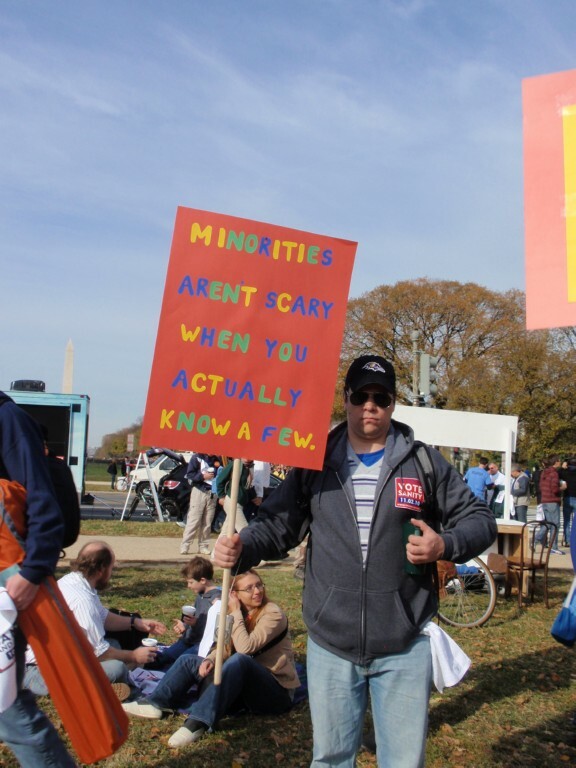 While Comedy Central and The Daily Show and Colbert Report initiated this rally, it took off beyond their wildest expectations. They only had a crowd permit for 60,000 people. They got almost 3 times that many. Many people I know through the progressive blogs and Facebook pages I read immediately decided to go - some made their reservations to fly the morning after the announcement of the rally. 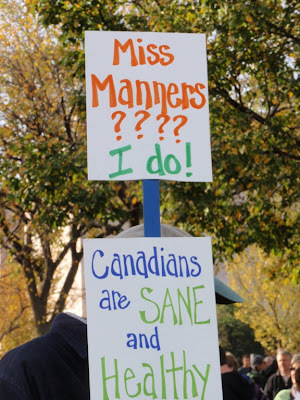 I was at that rally, I saw signs from people all over this country and from other countries as well. There were satellite rallies in other cities. Whatever Colbert and Stewart envisioned this rally to be (and I do think Stewart was completely sincere in his final speech, that he really does want to restore some semblance of sanity to this country), it succeeded beyond their expectations and tapped into something deep in the American psyche, especially among moderates and progressives. No, it wasn't the Martin Luther King march for civil rights in 1963. But it was something important, and it sends a message to Congress - whoever may control it after today - that the American public is sick to death of what's been going on for the past - heck, 10 years. Thirty years? More? Biggest message of all, which wasn't stated, but I think implied by holding the rally right before the election - GO VOTE FOR SOMEONE SANE TODAY. 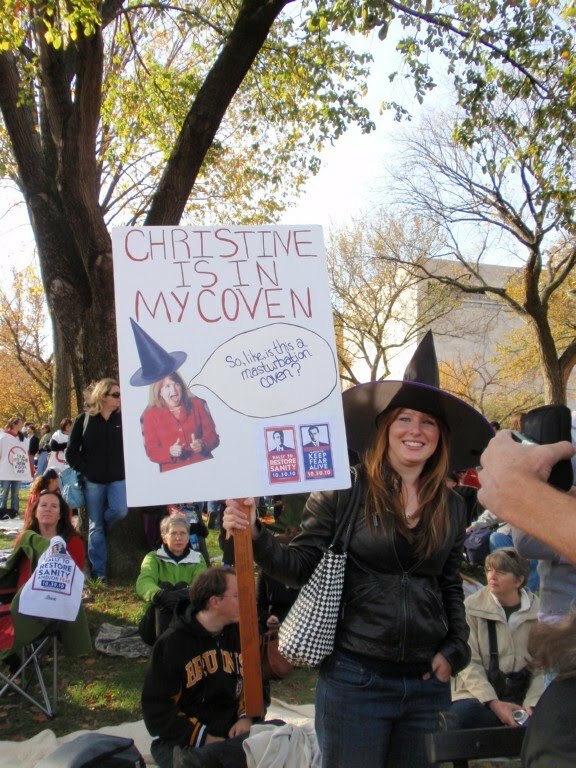 I'll be back next week to let you know how the Rally to Restore Sanity (and/or Fear) goes. Hope the weather is good in DC! ...winter is not far behind. But last week up at the cabin the foliage was near its peak, the weather was mild, and winter still seemed far away. But as the days get shorter, the nights get colder, and we know winter will be coming, inexorably, as it always does. This winter will seem particularly long if the Republicans win control of the House and possibly the Senate. I can only hope that the polls are wrong and the carnage won't be as bad as feared. But if it is, I hope the Democrats and the President see the error of their ways and don't react to a setback as a sign that they need to move more to the center. Instead they should realize that the lack of support on the Democratic side is driven more by disillusionment from their core constituents rather than anger by Independents against the liberal agenda. The recent decision by the Obama administration's Department of Justice to appeal the injunction against enforcing the military "Don't Ask, Don't Tell" law by Judge Virginia Phillips is a case in point. As a result of the appeal, the injunction against enforcement is now on hold. How can supporters of gay rights, who backed President Obama in 2008 under the assumption he wanted to overturn DADT, still believe in his support if the DOJ continues to block efforts to change it? The President claims he wants Congress to overturn it, but getting this Congress to do anything is, as we well know, impossible. So why not take advantage of the situation and let the judgment stand? 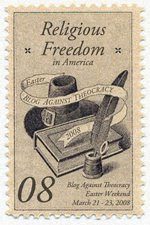 "Many people seem to believe that the law would disappear if the Justice Department refused to appeal the court order. But there are two reasons that’s not the case. First, the government has an obligation to comply with the nation’s laws, regardless of whether the president agrees with a particular statute. Doing otherwise would also set a precedent justifying similar nullifications by future administrations. The next president might, for example, decide not to enforce the recent health care reform law; all he would need would be a single ruling against the law by a single district court judge, which he would then refuse to appeal." "However, Mr. Obama may have another option: while appealing the lower court’s decision, he could have the Justice Department tell the appellate court that the executive branch believes the law is unconstitutional. In other words, the Justice Department would take the formal steps necessary to defend the law, but it would also make substantive arguments about why the law should be struck down. The Supreme Court could still vote to uphold the law, but the president’s position could significantly influence how the court rules. 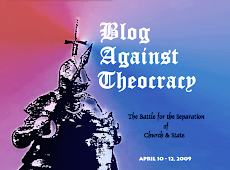 Doing so wouldn’t unfairly strip the law of adequate defense: if the administration took a stand against the law, the appellate courts would very likely allow lawyers for Congress or outside groups to appear and argue on its behalf." Sounds like a plan to me. It certainly couldn't hurt. UPDATE: Found a good article in the comments section of From The Left - an article in Newsweek that details even further the things the Obama administration could do to undermine DADT. I'm sure the President is stepping gingerly with this one to avoid controversy before the election - as if it would even help. But I hope once the election is over - whatever the outcome - that President Obama uses his next years in office to stand up for the principles he said he stood for during his campaign. Let's get DADT and DOMA repealed, let's get Guantanamo closed, let's get out of Afghanistan and Iraq completely. The latter would be the most important accomplishment he could make, since the wars are responsible for a huge amount of our soaring deficits - an amount that is never mentioned by the GOP or the Tea Partiers since military spending is sacrosanct to them. Reducing the deficit by lowering military spending would take some of the wind out of their sails. (Of course then they'd say the Democrats were weak on defense but that's another story and probably more easily countered than this vague financial "deficits" issue). Oh well, enough venting. I decided I'm going to leave my purple format up until DADT is repealed! In the meantime, below are pictures we took when we were in the Adirondacks last week. Enjoy the scenery and don't think about the upcoming elections if you can help it. But do get out and vote when the time comes, of course! While we may not be thrilled with the Democrats, the Republicans would be a lot worse. We got the Little Cat a cozy cat bed and she loved lying in it by the fire. We spent last week at Cape Cod. Yes, that was the week that the entire Northeast was getting pummeled by the remnants of Tropical Storm Nicole. Home in New Jersey, the rain was unending and torrential, from what I understand. But guess what? It didn't hit the Cape. We were really lucky - our weather was warm and summerlike nearly every day. It rained lightly at night a couple of times but cleared off by morning. We did have one foggy gray day, but it didn't rain. Friday of the week we were there, it did rain - but not until the afternoon, after we'd already been to the beach and Diva had had her swim in the pond. So we really chose the right week to get out of town. Below is Diva enjoying the beach. The main purpose in going to the Cape for the second time this year was to bring some of my mother's ashes and scatter them at the Cape where she spent time almost every summer since she was a little girl. We had also paid to have a bench installed with a plaque in memory of my mother and father in the little park surrounding the Eastham Windmill, so we wanted to see that as well. My half-sister and brother-in-law came up for several days to join us, as they had not been able to attend my mother's memorial service and wanted to be there for this second event. We brought some of the ashes down to the bay and I scratched them into the sand and let the water wash over them. My sister said a few words that brought tears to my eyes, and we stood there for awhile looking out at the bay afterwards. It was a cool and windy day and there was no one on the beach but us. And here is the view of the windmill from the bench. I still have a lot of my mother's ashes left. I may take some to Scotland next time we go - it was my mother's other favorite place. I didn't realize what a large amount of ashes there would be - the other half are buried next to my father in the cemetery, so I thought there wouldn't be that much. I could scatter Mom in a number of other significant locations if I want to. Israel is another place that comes to mind; she loved her trip there back in 1990. While some people wouldn't like the idea of being scattered hither and yon, my mother, who loved to travel, would probably think it's a great idea. One thing I won't be doing is embedding them in a tattoo or snorting them with cocaine a la Keith Richards. We had a good time at the Cape, but of course, it reminded me of my mom all over again. But at least I'll always know there is a little bit of her that will forever be there with me. 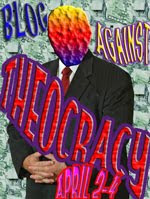 I still haven't been blogging on political matters the way I used to. The discourse in this country has gotten so low, the standards of both parties so poor, that I no longer feel as if they are speaking to me or anyone I know. The Democrats can't manage to stand up for one principle, all the while blaming all their problems on the Republicans. The Republicans, of course, are reprehensible beyond all belief, refusing to go along with a single thing the President wants done. The Democrats buried the Don't Ask Don't Tell repeal in some obscure part of a military spending bill, then tacked on some other controversial stuff (the DREAM Act)and then didn't let the Republicans make every single amendment they wanted to make. 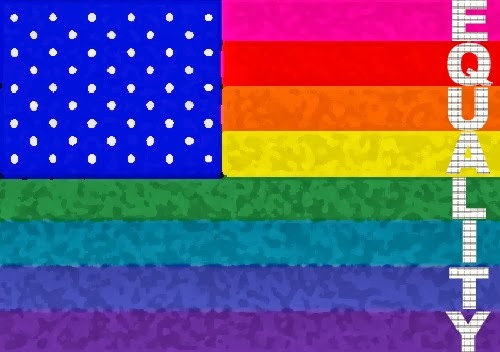 So as usual the Republicans had a hissy fit, got their 60 votes to vote the whole thing down, effectively killing DADT repeal until after the election, at the very least. Naturally the Republicans probably would've voted it down anyway, just for spite, but they were able to come up with some plausible, if silly, reasons to do it at this particular time. As ever, the GOP bears the greatest responsibility for having once again denied LGBT Americans from openly serving in the armed forces. But I can't help but wonder if the Democrats could've handled it better. Either way, it is just one more sign of the massive divisions in this country, and how no one in government can manage to get anything done. ...Which brings us to Jon Stewart's Rally to Restore Sanity. Last Thursday night, September 16, on The Daily Show, Jon Stewart announced that he is holding a rally on the National Mall in Washington, D.C. on October 30, 2010, to "Restore Sanity." 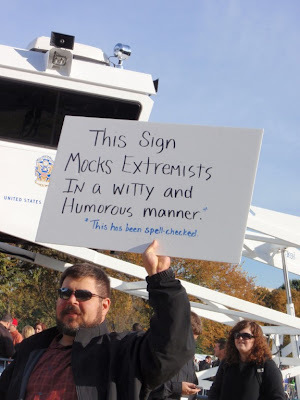 Using a montage of video clips, he demonstrated the extremist rhetoric on both the left and the right. He pointed out that 70-80% of the population is not part of the far left or far right, but we never hear from them "because you have sh*t to do." 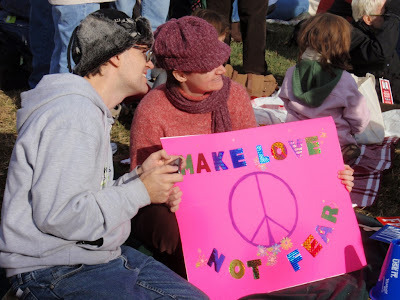 His announcement, done in tandem with Stephen Colbert, was followed by Stephen Colbert's own announcement for a rally on the same day: His satirical "March to Keep Fear Alive.". Both rallies will happen simultaneously on the Mall and no doubt will attract the same type of audience members, as I'm sure they planned. 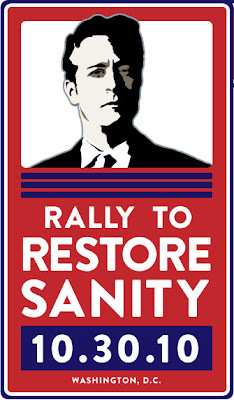 Something about these rallies, particularly the idea of restoring sanity, has resonated with many Americans. Not only have over 100,000 people said they are attending on Facebook, but satellite rallies are being formed all over the country. Now, I am not a person who goes to rallies; in fact, I really don't like crowds at all. 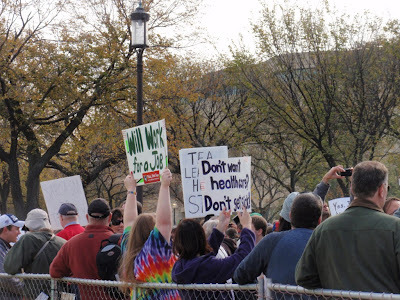 The only march I ever went on was in 1972 when I was a freshman in college, and on the first Earth Day, everyone marched on Boston Common protesting the war (Vietnam of course) and marching for the environment. 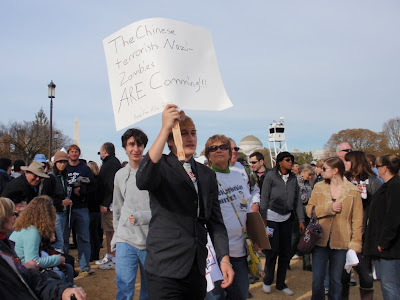 Then they stopped having marches. The apathy of the 70s began and that was the end of it all, at least for me. Maybe the beer was part of the reason, I'm not sure. 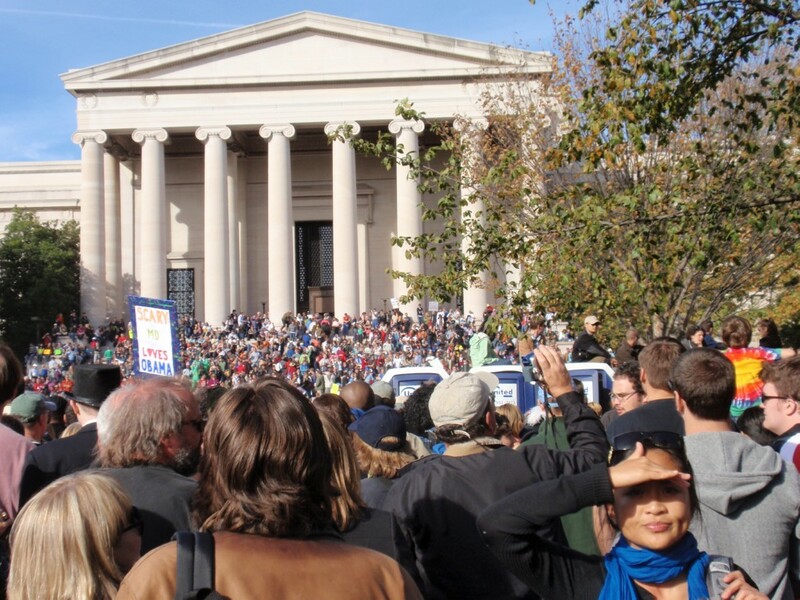 Anyway, when I heard about the Rally to Restore Sanity, my first reaction was, "Let's go! We should DO this!" My husband grunted and ignored me. It was 11:15 p.m., he was tired, he figured I'd forget about it by the next day. But I didn't. I started talking about it again. He said I was nuts, he said "This is no 1963 march on Washington - they're COMEDIANS! They're trying to make money!" But I persisted. It also helped that a very good friend of mine, who is always up for doing something spontaneous, also thought it was a great idea. So guess what? We're all going! Me, DH, my friend, her husband and probably even their daughter. Not only are we going, but many of my blogger and Facebook friends are going. People I haven't seen since college are going. This could be big. "So what," you may say. "Your husband's right. Jon Stewart is just a comedian. Why are people taking this seriously, as if it matters?" The answer is, he has struck a nerve with the American people. I think everyone is sick to death of hearing the wrangling going on in Congress. Nothing gets done. The Republicans in government are perfectly happy with that, but most Independents and moderate Republicans in the Real World are not. Those of us on the left are sorely disappointed that so many of the changes Candidate Obama promised are not taking place under President Obama, or if they are, they are being watered down until they are but a shadow of what was promised, just to get them past the Congress. Those of us who have worked in the business world know that nothing gets done unless people are willing to see the other side of things, and to work with those with whom they may not see eye-to-eye. But in Congress, it seems as if the participants never learned this. To them, it's "My side has to win at all costs." They don't care whether their "win" is a win for the American people or not. Politics doesn't just make strange bedfellows. Politics also makes people power-hungry, greedy and angry. I'd be willing to bet that testosterone levels go up in members of either gender once they get involved in politics. One reason is, there is something wrong with a system that has House Representatives up for re-election every two years. For all intents and purposes, these people are campaigning 24/7 for 24 months. There is never a real opportunity or incentive to settle down and work with each other, especially since the whole House turns over at once, every election cycle. Those elected to the Senate, at least, have six-year terms, which allow them some opportunity to actually do some work, which is why the Senate appears marginally more sane than the House. However, there is still always someone up for re-election each cycle, so it's not as if politics doesn't play a part at all times there as well. And what about the poor President? He has a four-year term, but after the first two years, he too is starting to run for re-election. Heck, the other side starts thinking of who they're going to put up against him next time during the month after his election! At one time, when the Founding Fathers first came up with the idea of the Congress, they had no idea there would be people who made a career out of being in politics. They never envisioned six-term or seven-term Congressmen, or Senators who served 40 years in office. They thought people wouldn't want to be away from their farms that long; that one term, or maybe two, would be quite enough. It is time for a change in how Congress does business. We need longer terms, and fewer of them, for the House, and term limits for the Senate. But I digress. "What about Jon Stewart's Rally?" you say. "I thought that's what we were talking about." It is. But one reason for the partisan politics getting worse and worse is the constant election cycles, as well as, of course, Cable News shows - "News" being a term I use loosely, since none of these shows are news shows anymore, they are all partisan on one side or another. The media truly is the message. 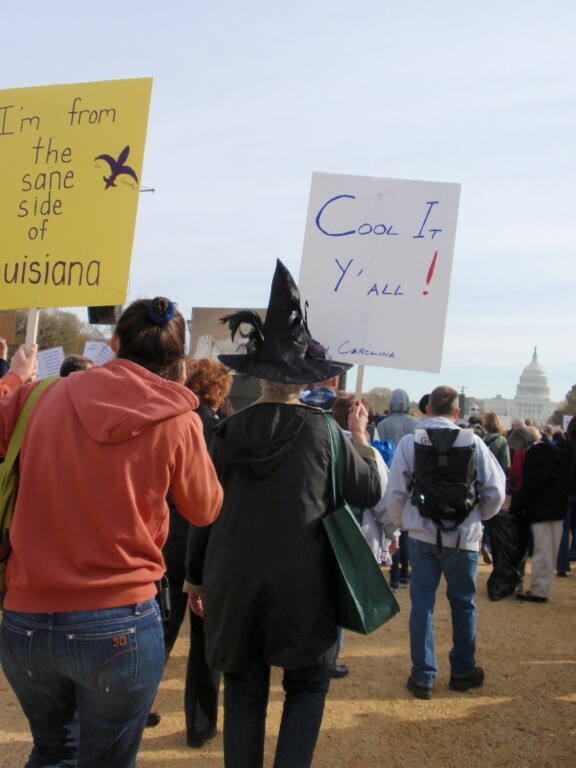 That's why all we see on these shows are the Tea Partiers. It doesn't matter that these people are a small part of the total population, they're making all the noise, and they're getting all the publicity. Glenn Beck's rally in Washington had all kinds of coverage on every station, and the pictures of the rally showed a sea of faces at the Mall, giving the impression that his followers are a huge Movement. Now, finally, the rest of us have a chance to have OUR say. 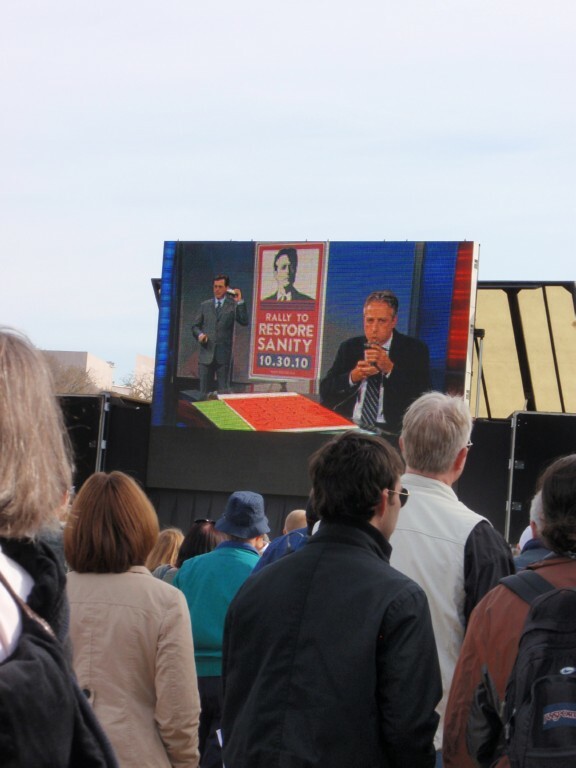 Jon Stewart's "Rally to Restore Sanity" will give the moderates (and liberals - since most of Stewart and Colbert's fans lean left) - a chance to show their numbers. Even among liberals, many of us decry the nasty discourse on both sides of the aisle, and the inability of either side to work meaningfully together. "This isn't a concealed campaign rally for either party. It's a counterprotest against the rising tide of conformity that causes hyperpartisans to demonize people with whom they disagree. It's the anti-demagogue Saturday on the mall; people taking to the streets and yelling, 'Be reasonable!'" That said, I do hope that the excitement generated by this gathering will help propel the moderates and independents to the polls, and energize them to vote for the more reasonable candidate of their choice. Otherwise we might end up with a Congress full of Tea Party representatives. Jon Stewart likes to point out that he specializes in "fake news" and is a comedian. But when you're voted the most trusted man in news, that means you have a responsibility to uphold. I think he is up to it and that this rally will be an amazing event. I look forward to seeing many fellow bloggers and Facebook friends there, as well as friends from my own town. And if you're not going to Washington, I encourage you to go to a satellite rally in your area if they are having one! Labels: Jon Stewart, March to Keep Fear Alive, National Mall, politics, Rally to Restore Sanity, Stephen Colbert, The Daily Show, Washington D.C.
We returned Monday night from ten days at the Cabin. In some ways it felt even longer, in a good way, because over the Labor Day weekend my dear friend and her daughter were visiting, then we had a couple of days alone, and then my father-in-law came up on Thursday and stayed until Monday. So it was as if we had three separate trips to the cabin, one after the other. I was really glad my friend and her daughter could join us for the long weekend. My friend's daughter is very special to me, since I didn't have children of my own, and I've known her since she was a toddler; so I think of her as the daughter I never had. As Megan got older we joked that she takes after me, since we share some of the same tendencies and little quirks. So she calls me "MO" for "Mother Other." (We didn't want it to be Other Mother, as OM sounded too much like a yoga mantra). To keep her anonymity (she is almost 15 and I'm sure wouldn't want me to be blogging about her), in this post I will call her Megan, which is not her real name. While they were there, the weather was very changeable. The first few days were basically nice, but windy with a mixture of clouds and sun. It was cool enough in the evenings to sit out on our deck huddled around the fire in our brass chiminea, enjoying the flicker of the flames and telling stories. Megan had just gotten back from sleepaway camp, where she had spent four weeks over the summer, two in early July and two at the end of August. So she regaled us with all the camp songs she could remember, and the ghost stories that the counselors had told them. I chimed in with some of the ghost stories we used to tell around the campfire on our Girl Scout campouts, as well as singing a few of the songs I knew. I love camp ghost stories; they all share the common theme that whatever horrific thing happened, it happened RIGHT HERE at this camp, and the person telling the story KNOWS a person who was there at the time. During the Labor Day weekend we spent our time together eating, drinking, reading books, walking in the woods, and journeying out for adventures. 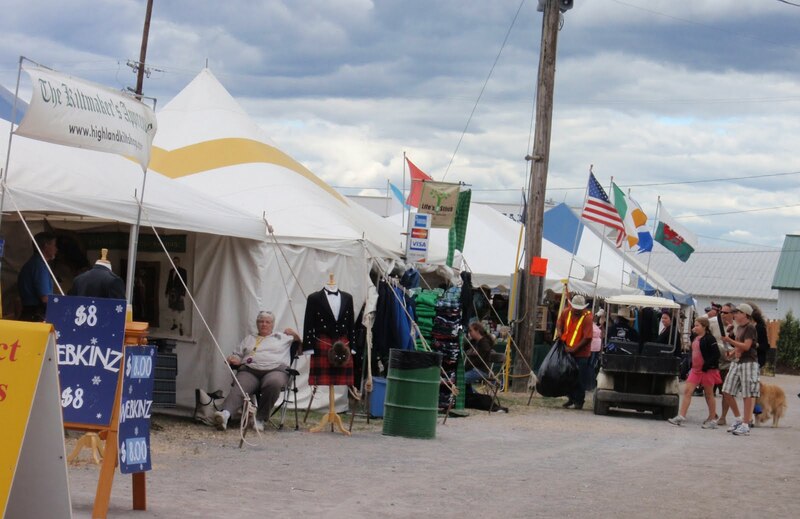 One day we went all the way back to the Albany area to go to a Scottish Fair they were having in Altamont. It was one of those breezy, changeable days with clouds and sun, a perfect day for walking around the fairgrounds. 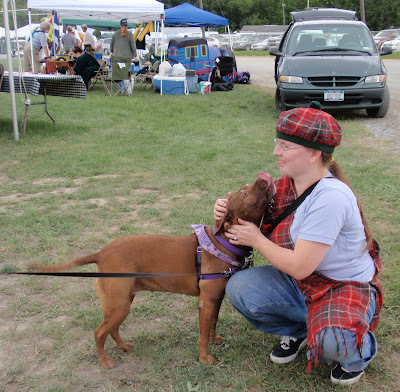 Diva was welcome there, and spent the day meeting people she'd never met before, as we toured the various Scottish and Irish inspired jewelry, clothing and food booths. We stopped to watch the Highland Games for awhile and enjoyed the throwing of the caber. We were surprised to come across a fish & chips booth that was run by Kearny, New Jersey's own Argyle Restaurant. Sure enough, there was one of the men we'd seen many a time when we attended the Robert Burns Suppers at the restaurant. Of course we had to patronize a New Jersey business, so my friend opted for a plate of fish and chips, while DH and I chose fried haggis balls. Yes, that sounds really grotesque, but fried haggis balls are great. Take a bunch of meat, spices, and onions, wrap it in thick breadcrumbs and dough, and throw it in a deep fryer, and out comes crunchy, salty, tasty goodness. I'm sure my arteries have still not recovered. Haggis balls are probably almost as "good" for you as Scotch Eggs (fried dough around sausage with an egg in the center, which Argyle's had run out of before we got there, to our dismay). 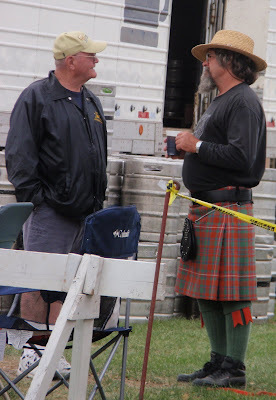 We also stopped at the Beer Tent and had a pint while listening to a rollicking good band play Irish and Scottish music, followed by another group playing the pipes and drums. All in all, it was a great day for the Scottish - and anyone else who enjoys the food and music! Following are some pictures we took at the fair. My friend and her daughter holding Diva as she observes the native Scottish wildlife. There were kilted men everywhere. 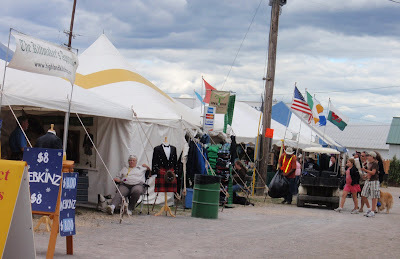 A view of some of the booths selling various goods and trinkets. There was a lot of food to be had. And lots of kilts to buy. A young man clad as a primitive Scottish warrior of some kind, wielding his cell phone anachronistically. Diva meeting new friends at the fair. While our friends were there, we also had a good dinner down in Whitehall, NY at our local Italian restaurant, The Roma Restaurant, which has the best lasagna I've found anywhere, even in New Jersey. After our friends left, it seemed quiet, and we felt lazy and just relaxed for a couple of days. Unfortunately for DH's dad, the weather turned cooler and cloudier when he arrived, so we were stuck inside more than we'd hoped. However, we did have one beautiful day where we sat out on the deck to eat breakfast in the sun, enjoying pancakes and mimosas. (DH's dad brought up the champagne for that purpose). On one of the cloudy days, we drove to Glens Falls and went to the Hyde Collection, a small exquisite museum contained within the Hyde family's historic home. It reminded us of a smaller version of the Frick or Isabella Stewart Gardner museums. In addition to the permanent collection, there are newer wings added to the house that are used for changing exhibitions. We had just missed a collection of Andrew Wyeth's work on the day we were there. That was just as well, since the museum was remarkably empty during our visit; one of the guards told us there had been 700-800 people there over Labor Day weekend viewing the Wyeth exhibit. The museum overlooks the Finch Paper Company factory, an industry that has been in Glens Falls since 1865 when it was founded as Finch Pruyn & Co. (It was sold in 2007 to a holding company funded by investors from another paper company, and is now known as Finch Paper LLC). The "Pruyn" part of the name is where the Hydes come in. Charlotte Hyde was originally Charlotte Pruyn, daughter of the papermill owner, and when she married Louis Hyde, he became a vice president in Finch Pruyn, thus helping to fund their hobby of art collecting. The museum is still set up as a house, with each room containing priceless furniture, tapestries, and decorative pieces dating back as far as the 15th century. The artwork on the walls is equally exquisite. While the collection of paintings is not huge, it comprises gems from various eras and countries, from Rembrandt, Rubens, El Greco and Van Dyck to Renoir, James Whistler, Winslow Homer, Albert Bierstadt and even Picasso. This museum is a must-see for any art lover. 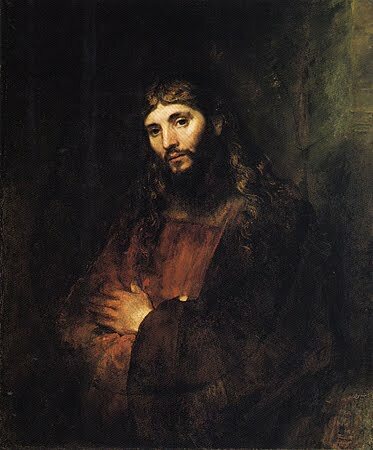 Below is one painting from the collection - a portrait of Jesus by Rembrandt (taken from the Hyde Collection website). The meal we had in Whitehall on our way back from the museum was also well worth mentioning. For anyone not familiar with Whitehall, my excitement about this restaurant has to be explained. Whitehall is a rather down-at-heel post-industrial town on the banks of the Champlain Canal. The town was formerly prosperous, due to the proximity of the canal, which once transported goods up and down its length, resulting in many businesses springing up along its shores, and a number of grand homes. Unfortunately, now that this type of transportation is done mainly by truck, time has kind of passed by Whitehall. There are many empty shops and shabby storefronts, and very few good restaurants. There is one over at the marina that we have not yet tried, and one on the other side of the canal that was good but nearly empty the time we were there. Roma and the House of Pizza are the ones we frequent most often. So imagine our surprise when we drove down the main street by the canal and saw a lit up, busy new restaurant one evening! We looked it up on Google and sure enough, they had just opened in August and were obviously fulfilling an unmet need in the community, as there was a line waiting outside the door to get in. 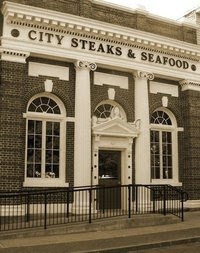 City Steaks & Seafood is hip, trendy, and reasonably priced, with great lobsters and steaks as well as other more ambitous dishes. The next day we had to pack up and leave our cabin until our next visit, which won't be until October 8th, as we are heading up to Cape Cod for a week in between. Before then, however, I will be catching up on blogs and blogging!